Disclaimer: Read no further if you have a special fondness for nursery rhymes and do not wish to have one ruined for you permanently. I vividly recall this nursery rhyme carrying an entirely different meaning for me after I started my neurology residency. It was a rainy day in Seattle, and as this rhyme came to mind while I was driving, it suddenly struck me – the old man sustained either a subdural hemorrhage or an epidural hemorrhage. He experienced a period of lucidity after hitting his head (enough such that he was able to get to bed), but he did not get up the following morning. The story became grim. 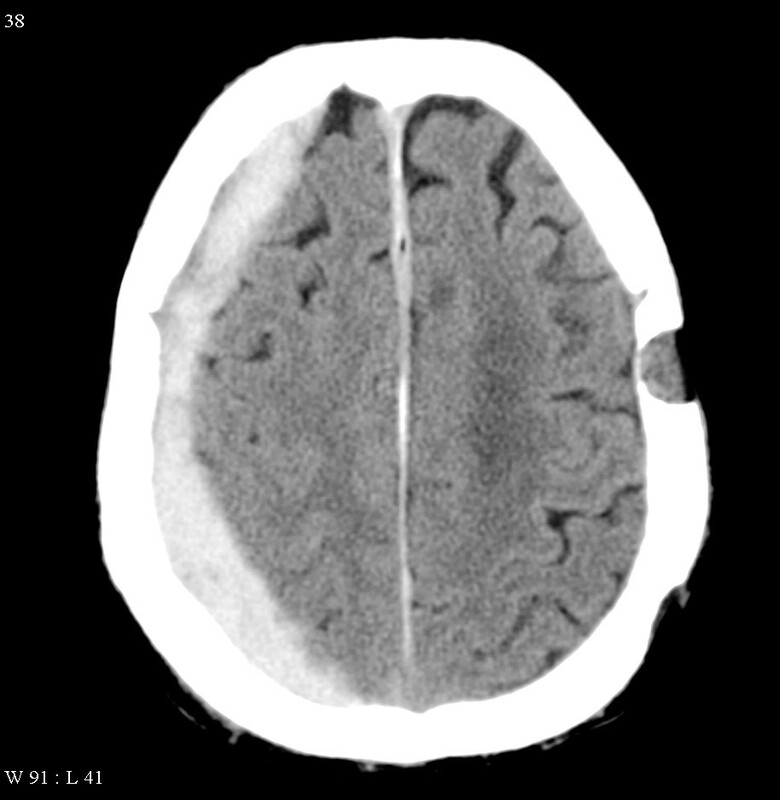 This is a CT scan taken from a patient with an epidural hemorrhage, or bleeding from the middle meningeal artery into the space between the skull and the dura. Note the severe compression occurring on the brain. An artery that travels between the dura and the skull, known as the middle meningeal artery, is vulnerable to tearing with direct trauma to the skull. Typically there is a brief loss of consciousness followed by quick recovery, and these patients often do not seek medical attention because the immediate drama is so short-lived. However, as blood pools from the middle meningeal artery between the dura and the skull, the pressure on the dura creates significant compression on the brain and can quickly become a fatal situation. This is what occurred as the cause of death in actress Natasha Richardson when she fell while skiing in Canada in 2009. She died at the age of 45. This is a CT scan taken from a patient with a subdural hemorrhage (the crescent-shaped collection of white material along the inside of the skull is blood), bleeding from a torn vein in the space beneath the dura layer of the meninges. I suspect this was the cause of death in the old man from the familiar nursery rhyme, given that these hemorrhages are more common in the elderly. 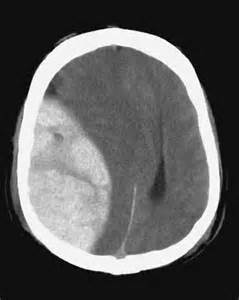 Subdural hemorrhages are more common in the elderly patient population. Large numbers of veins fill the space between the dura layer and the arachnoid layer, and as the brain ages and decreases in size (yes, the brain shrinks with aging), more sheer stress occurs on these veins. A relatively small hit on the head, or even a cough or a sneeze, can result in the tearing of one of these veins, and the subdural space begins to fill slowly with blood. The key word here is slowly. This is not usually as rapid of a neurological demise for the patient as occurs in a patient with an epidural hemorrhage, because epidural hemorrhages involve an artery, which carries blood under high pressure, filling the space rapidly. Blood flowing from a vein flows more slowly because the pressure is lower. Picture water gushing from a water hose (epidural hemorrhage) versus dripping slowly from a faucet (subdural hemorrhage). The pattern of blood layering on a head CT scan can also distinguish between an epidural hemorrhage and a subdural hemorrhage as well, as the images reflect. I now carry the curse and the blessing of pondering traumatic intracranial hemorrhages every time I hear this nursery rhyme performed on a children’s CD or when I see it printed in an anthology. Perhaps I have passed this on to you as well and the rhyme will carry a different meaning going forward. The story of the old man offers an important lesson in neurological vigilance, though. When a young person hits his or hear head after falling while skiing or in any other traumatic fashion, anytime there is even the briefest loss of consciousness, a head CT scan is strongly indicated, even if it does disturb vacation plans. When an elderly person hits his head just before going to bed, maybe it is not a terrible idea to wake him up several hours later and ask a few questions, just to be on the safe side. It’s also important to remember that after an elderly person hits his head, even if he does get up in the morning, when he still has a headache a week or two later, that head CT scan can be life-saving if it detects a subdural hemorrhage. I know that nursery rhymes have other meanings many times, but why can’t the old man just be the sun hidden by clouds? It’s says, didn’t wake up in the morning. I have over 5 years in sobriety and I take it that he drank too much, fell over in a drunken stuper and couldn’t get up because of a hangover. Just says morning not that he didn’t wake up at all.